Baroque cellist, Beiliang Zhu, is a past grand prize winner of the Leipzig International Bach Competition and considered to be one of the finest baroque cellists in North America. She views playing the richly chorded suites with six movements each—a prelude, allemande, courante, sarabande, gigue, and other dances—as an “extraordinary journey”. Beiliang is the new principal cellist of the Pacific Baroque Orchestra. One of Canada’s most successful young baritones teams up with one of Canada’s most well respected and accomplished pianists for an introduction to Franz Schubert’s deeply moving 1827 song cycle “Die Winterreise” (Winter’s Journey). Cappella Borealis, Vancouver’s ensemble for early brass instruments, will introduce the “sackbut” — the ancestor of the modern trombone — and its repertoire. The ensemble will perform a variety of compositions from the Renaissance and Baroque eras that highlight the sackbut’s unique tone colour and technique; in addition, the group will discuss the historical evolution of the sackbut and how it differs from its modern counterpart. The extraordinary Düben Collection contains over 2,000 manuscripts of 17th and early-18th century music by more than 300 European composers, collected by members of the Düben family and donated to Uppsala University in 1732. The collection is thought to include the music library of the Royal Swedish Court, where four of the Dübens served as kapellmeisters from 1640 to 1726. La Modestine will perform a selection of rarely-heard gems from the collection, including sonatas by Buxtehude, Becker and Reincken. For over five years, EMV has offered an annual series of free lecture-demonstrations at Green College at UBC, related to our season programming and designed to inform and grow our audience base. These events have been increasingly well-attended and have stimulated a dialogue between the organization and the local community regarding the wider context of our activities in the community. The College was founded in 1993, thanks to a gift from Dr. Cecil H. Green. The College has formal ties with Green Templeton College, a sister institution at Oxford University also endowed by Cecil Green, and with Massey College at the University of Toronto. It was established as a centre for advanced interdisciplinary scholarship, with a mandate, reflecting Cecil Green’s vision, to bring together disciplines across the University through non-curricular programs and collaborations, while also opening the University to the wider local community. The College’s commitment to exceeding the ordinary limits of academic discourse and to providing a venue hospitable to constructive thinking on all fronts is captured in the College’s tagline “Creating New Horizons.” Special visitors are invited each academic year to enrich conversations at the College and on the UBC campus, both through regular series of interdisciplinary talks and the prestigious Cecil H. and Ida Green Visiting Professorship program. The College also hosts a Writer-in-Residence program. With rare exceptions, the College’s academic programming is open to the whole UBC community and the general public. The College welcomes those from both within and outside the University to join residents and members for dinner in the Great Hall. 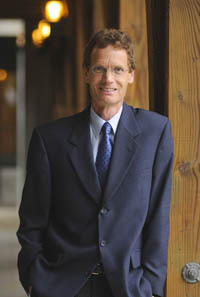 Dr. Mark Vessey has been the Principal of Green College at UBC since July 1, 2008. Prior to his appointment as Principal, Dr. Vessey had a long history with the College, having previously served as Acting Principal in 1998/99, and as a Faculty Member of Green College since 1994. Dr. Vessey obtained his B.A. in English at the University of Cambridge and his D.Phil. in Ancient History at the University of Oxford. He came to UBC in 1989 as an I. W. Killam Postdoctoral Fellow in the Department of English, and was appointed to a faculty position in that department in 1990. He held a Visiting Fellowship at All Souls’ College, Oxford, in 1997 and was Visiting Professor of Augustinian Studies at Villanova University in 2000. In 2001 he was awarded a Canada Research Chair in Literature / Christianity and Culture (renewed in 2005), and in 2005 won a Senior Killam Research Prize at UBC. Before taking up his position as Principal of the College, he served as Associate Head and Chair of the Graduate Program in English. He is a member of the UBC Senate, representing the Faculty of Arts, for the triennium 2008-11. Dr. Vessey’s research focuses on processes of text-, canon- and discipline-formation in the Latin Christian culture of the later Roman Empire (4th to 6th centuries) and their role in the shaping of longer-term discourses and institutions of “western civilization,” particularly those associated with “literature.” He has published in the fields of Roman history, patristics, medieval studies, Latin and English Renaissance literatures, literary theory, and the history of the book. He is married to Dr. Maya Yazigi and they have a daughter, Leila.